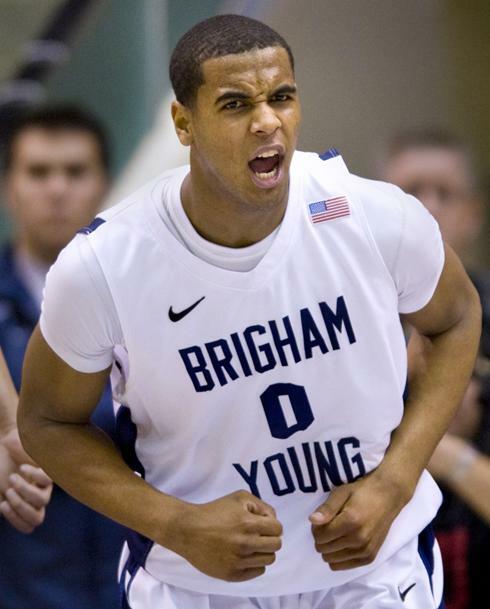 ESPN’s Diamond Leung is reporting that BYU will reinstate rising-junior forward Brandon Davies to the team in the 2011-2012 season. Davies’s controversy last season made national headlines when he was kicked off the team for violating the school’s honor code, which involved having a sexual relationship with his girlfriend. It was sad to see him go last year because he’s truly a promising basketball player. He was averaging over 11 points per game on a team where Jimmer Fredette took almost every shot. He added 6.2 rebounds per game as well and provided length defensively with his 6’9″ frame. The Jimmers Cougars were not the same team after he left. BYU drew some criticism for their decision–mostly out of an inability for most people to understand how you can kick a 20-something year old kid off a team for something that 90% of kids his age are doing (no, not drugs). Still, I had to respect the decision. An honor code is an honor code. BYU would have to be considered one of the very few schools in America that doesn’t bend their own rules for athletes. Surely, the school didn’t want to do it, as a deeper run into the tournament means more revenue for the school, but you have to remember that sports is far from the end-all be-all at that school. Many star athletes will take a full two years off from their sport to go on a Mormon mission. It’s just different. I respect even more the decision to reinstate Davies. I guess this was going to happen all along, but it’s nice to see. By all accounts, Davies is a great kid, and he served his punishment. I can’t imagine he is the only basketball or football player or any student at BYU to break that rule. He just got caught. With Fredette gone to the NBA this season, a lot of offensive opportunities open up, and Davies should be in line to get the bulk of them. Look for him to turn some heads this season. And, remember, he is only a junior. He could be a very interesting player to watch over the rest of his career.